The Walt Disney Company started in 1923 and is nearly 100 years old. During that time, it has had so many impressive accomplishments in so many different areas that it would be hard to keep track of even the most significant. However, behind those achievements are countless films, theme parks, lands, animation, attractions and more that were proposed and almost produced but were abandoned and forgotten before reaching completion. There were countless good reasons for not pursuing these projects from lack of time, lack of necessary technology, lack of money and even lack of the personnel with the talents needed to complete them. Sometimes something can just fail to come together even though it seemed like a good idea. Hidden in the Disney Archives are artwork, scripts, models and more for these orphaned ideas. Sometimes parts of these projects are reformatted or cannibalized for something else. Big Thunder Mountain Railroad was actually a part developed from Imagineer Marc Davis' proposal for the much larger and elaborate Thunder Mesa for Walt Disney World. The very first original Donald Duck comic book, Donald Duck Finds Pirate Gold, was adapted from an unmade animated feature film script. Other times, things just remain in the files gathering dust. However, you wouldn't think that a Sherman Brothers musical approved by Walt Disney himself would be one of those things. However, that is just what happened. The story of Hansel and Gretel is a well known cautionary German folk tale first recorded and published by the Brothers Grimm in 1812. It tells the tale of a young brother and sister lost in the woods who are tricked by a cannibalistic witch into her house made of tasty sugary confections, like gingerbread, cakes and candy. The witch intends to cook and eat the children but Gretel shoves her into her own oven and the children escape. Composer Engelbert Humperdinck wrote an opera about the story in 1893 because his sister wanted to put on a children's play based on the tale. He became so involved with the project that it expanded into a full opera for both children and adults. Walt Disney had tackled the story earlier in the 1932 Silly Symphony Babes in the Woods. 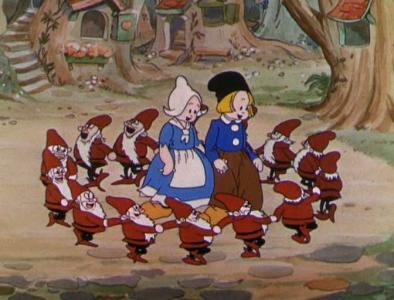 Walt altered the original fairy tale significantly even including some happy, bearded dwarfs in matching red outfits who help save the children and having the witch, who earlier was able to fly in the sky with a magic broom like traditional witches, but not in the original story, slip by herself into her boiling cauldron and not be pushed by Gretel. It was the third Disney animated short made in Technicolor and the first attempt by Disney to do a "serious" adaptation of a classic fairy tale. The witch was voiced by Lucille La Verne who would later go on to voice the Queen and Old Hag in Snow White and the Seven Dwarfs (1937). At some point in the 1930s, Hansel and Gretel was briefly considered as a possible animated feature with artist Albert Hurter creating some concept sketches for the film. In 1961, Disney executive Jack Cutting sent a series of memos to Walt about the purchase of the rights to the Humperdinck opera but Walt wanted to do something original. However, in 1964, Disneyland Records released a 33 1/3 rpm long playing album Walt Disney Presents The Story of Hansel and Gretel using the music from the opera by Humperdinck. The cast included Laura Olsher as the narrator, Michael Donahue as Hansel, Ann Jillian as Gretel and Martha Wentworth as the witch. The album also featured the singing voices of Marni Nixon, Sally Sweetland and Kathleen De Spain. "Walt learned his lessons with Babes In Toyland in 1961 and applied those lessons to Mary Poppins in 1964. He followed Poppins with The Happiest Millionaire, and ultimately we [the Sherman Brothers] completed The One and Only, Genuine, Original Family Band and Bedknobs and Broomsticks. "But along the way, we also worked on a now legendary 'lost' Disney live-action musical, Hansel and Gretel. "It was early 1966 when Walt paired us once again with screenwriter A.J. Carothers with whom we were just finishing The Happiest Millionaire. Also joining us from the Millionaire team were producer Bill Anderson, director Norman Tokar and the delightful Geraldine Page who had tentatively agreed to play the role of the witch. "Hansel and Gretel wasn't headed for the theaters though. It was envisioned as a 90-minute live-action television special. And that, we believe was to be its ultimate undoing. "The project came together quickly. By September , we had completed six songs to accompany AJ's script and the pre-production process had begun. It didn't take long before it became apparent to the sharp pencil people that Hansel and Gretel would be an expensive project to produce – besides the inherent higher costs of a musical, the story called for plenty of intricate special effects. "As the critical 'go/no go' decision approached, we lost Walt, the one person at the Studio who could see past the bottom line. In the crazy and uncoordinated months that followed Walt's death, Hansel and Gretel was cancelled and [almost] forgotten." Hansel and Gretel was production number 7252 with the first draft completed by September 27, 1967. Besides Millionaire, Carothers worked at Disney for roughly seven years, writing scripts for Miracle of the White Stallions (1963) and Emil and the Detectives (1964), among other Disney work including Never a Dull Moment (1968). Carothers was the creator of The Nanny and the Professor television series, wrote the story for Michael J. Fox's film The Secret of My Success (1987) and was responsible for the scripts for more than 100 motion pictures, television shows and plays. One of his final works was writing the book for the Sherman Brothers stage musical Piccadilly in 1996. Carothers' draft eliminated the cruel stepmother who, because it was a time of famine in the original tale, had sent her two children off into the forest so that she and her husband wouldn't starve. So, like many Disney stories, the mother was gone and the father struggled to take care of his two young children. It is especially challenging because the children are rebellious and not well-behaved. The story opens with them wreaking havoc on their newest housekeeper who finally gets so fed up that she quits. The father is a woodcutter and is away most of the day so needs a housekeeper to watch over the young Hansel and Gretel. Deep in his heart, he knows that what they really need is a mother and what would fill the hole in his own heart is a new wife. However, he realizes that is just a dream and doesn't know what else he can do to handle his two children. One day while chopping wood in the forest, he thinks he sees a beautiful maiden wandering through the trees. He drops his axe and tries to follow her but she is always temptingly just ahead of him out of reach. He arrives at a waterfall that he has never seen before that is cascading into a tranquil pool. He can no longer see any sign of the mysterious woman so stoops down to take a drink from the pool to refresh himself. As he stares into the water, he sees her face appear briefly in a reflection but a bird flies down and disturbs the surface of the water and the image disappears. He gets up and looks around but sees no one. However, all of this activity is being watched by a witch in her crystal ball. The one power in the entire universe she has been unable to obtain is true love. With that one missing element, she could rule the world…somehow not clearly explained. She understands that she cannot steal love. True love must be freely given. She decides that perhaps she can trick this love-sick woodcutter into giving her the gift of true love. Unfortunately, her wickedness has made her exterior just as misshapen and ugly as her interior. Using magic, she transforms herself into a beautiful young woman, similar, but not exact, to the one the woodcutter was chasing. She appears at his cottage and uses her guile to become the new housekeeper, an offer the man eagerly accepts. Hansel and Gretel are still a handful and they spitefully keep interfering with the witch's attempts to woo their father into giving her true love. The witch decides that she must get rid of these two brats if she is to get what she wants. She tricks them into going into the forest where they get lost. A group of helpful animals sing to them: "Chin up/ You'll be happy hearted / Once you get it started/ Up with your chinny chin chin!" The witch's cottage deep in the forest is the traditional gingerbread house from the classic fairy tale decorated with tempting sweets of every kind so the children enter. They find themselves trapped in a house that looks more like a mad scientist's frightening laboratory filled with an army of demons who are described as "grotesque creatures who dance with delight" at seeing their future feast. The witch transforms back into her true sickly green identity and reunites with her talking raven who, unlike the one in Sleeping Beauty (1959), is capable of speaking words clearly. It would probably have been done as an elaborate Audio-Animatronics character. A battle of wits and massive physical battle ensues between the children inside the cottage and the witch including lightning bolts, furniture magically flown to the ceiling so the children can't hide and even an extended scene with them shrunk in size and dashing around the cottage and its devices. The special effects were extensive, including the need for the witch's flying broom since, like in the Silly Symphony, she utilized that mode of transportation. Being a Disney film, Gretel would not have shoved the witch into the oven to burn in horrible agony. The witch herself slips into the oven and is baked into gingerbread cookies. Obviously this draft was in need of Walt's story-editing skills. Tentatively, Matthew Garber and Karen Dotrice, who were the child stars of Mary Poppins (1964) and The Gnome Mobile (1967), were seriously considered and then it was decided they would be too old for the roles. Bill Anderson, Norman Tokar, the Sherman Brothers and AJ Carothers were in New York for the premiere of the film The Happiest Millionaire in New York. Actress Geraldine Page (who would later supply the voice of Madame Medusa in the 1977 animated feature The Rescuers) was in the film playing the mother of John Davidson's character and, while doing publicity at the premiere, the group got together and Page tentatively agreed to play the witch. However, even with a script and production team in place and pre-production beginning, some executives at the studio did not share the same enthusiasm for the project as Walt did, especially when it was going to be so expensive. Since Walt had died in December 1966, the project no longer had a champion and it disappeared. The Sherman Brothers composed six songs for the musical. The witch would have sung two songs. The woodcutter would have sung Guardian Star and the love ballad called Love Is… ("Love is the crowning glory/There's no way to count its worth/ But when you wear its golden crown/ You're the richest man on earth!"). The two children also had a song ("If I Could Be What I'd Like to Be"). Richard Sherman once told me, "It should have been made. It would have been wonderful." I personally was not enchanted by this proposed film, but anything could have happened. Many times I have read a synopsis for an upcoming film and felt that it would be a dud. I must admit I felt that way when I first heard about the Pixar film A Bug's Life. It taught me never to pre-judge a Pixar film just from the synopsis. Almost equally as "lost" as the proposed feature musical was a Disney television special of the story of Hansel and Gretel directed by Tim Burton that aired once on the Disney Channel on Halloween night October 31, 1983. It has only been shown three other times over the decades at Tim Burton retrospective film shows around the world. Costing $116,000 and filmed on 16mm film, the live-action roughly half-hour special featured a cast of Asian amateur actors, Japanese toys (using stop motion animation) and kung fu fights. I have never seen this film and my friends who have give it mixed reviews. I don't consider the unmade Hansel and Gretel musical as a lost treasure, but I have always been intrigued by things that got so far along in the production process and then were abandoned.